The following topic describes all the visual elements and terms used in a standard RadCalendar control. SelectedCell: This is the currently focused cell. CurrentCell: This is the currently focused cell. BlackoutCells: These are cells that can not be selected. MonthView: the user can select a day from the currently displayed month. YearView: the user can navigate to a month from the currently displayed year. 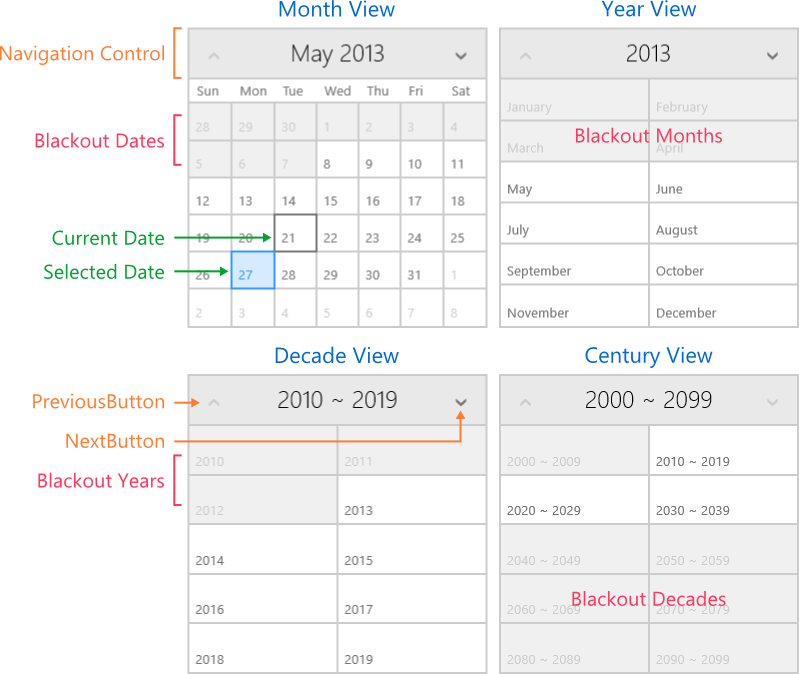 DecadeView: the user can navigate to a year from the currently displayed decade. CenturyView: the user can navigate to a decade from the currently displayed century. Switching to upper view is done through the Navigation control, and to lower view - by selecting item in the current view. Header: Clicking on the Header navigates to upper view: MonthView -> YearView -> DecadeView -> CenturyView.